This is the text of a War Department letter sent to my grandmother more than a year after Babe’s death and after she had apparently requested additional information about Babe’s service. There is a link to a PDF copy of the original letter at the bottom of this post. This letter begins a brief line of review concerning the return of Babe’s remains to the United States, resulting in his final interment at Long Island National Cemetery in Farmingdale, N.Y.
Reference is made to your letter in which you requested information concerning your son. Col. Charles D. Carle, commander of the Records Administration Center in St. Louis. I can imagine that hundreds of letters like this went out over his signature. The records show that Frank D. Mauro, Army serial number 32 810 329, was inducted into the military service 19 February 1943 at New York, New York, and was transferred to the Enlisted Reserve Corps the same date. He reported for active duty 26 February 1943 at Camp Upton, New York and received his training at Camp Wheeler, Georgia, and Transfer, Pennsylvania. He left the United States for overseas service 14 July 1943 and arrived in North Africa 21 July 1943; Gulf of Salerno, Italy 21 September 1943. He participated in the following campaigns in Italy: Naples-Foggia from 21 September 1943 to 21 January 1944; Rome-Arno from 22 January to 9 September 1944; North Apennines from 10 September 1944 to 4 April 1945; and Po Valley from 5 April to 4 May 1945. Technician Fifth Grade Mauro died 4 May 1945 as a result of drowning near Novorro, Italy when the vehicle in which he was riding was forced into a canal. 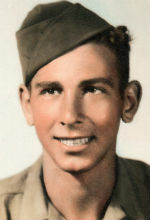 He was serving as a member of Antitank Company, 168th Infantry Regiment, 34th Infantry Division at the time of his death. The records further show that your son was authorized to wear the Bronze Service Stars and the Combat Infantryman’s Badge. He was awarded the Good Conduct and the Purple Heart Medals. The Quartermaster General, Washington, D.C., has jurisdiction over matters pertaining to the burial of our military personnel who die overseas. A copy of your letter has accordingly been forward to that officer for necessary action. Permit me to express my deepest sympathy in the loss you have sustained.